Cecil Lon Pierce was born January 24 1928 in Beatrice, Gage County, Nebraska to Venus and Marie (Blum) Pierce, he was also my father and a man that I not only admired but adored. He was my hero and there was no other like him. He was the third son to be born to Venus and Marie and the first of the children to be born in a hospital. I asked him why he was born in a hospital as the other two had been born at home. He said he didn’t know but maybe they had worry of problems. Grandmother Marie had lost a baby at 5 months prior to her pregnancy with Cecil. She thought it was caused from riding in a buck board wagon. Growing up on a farm in rural Nebraska was hard as he lived through the great depression. The Great Depression was the worst economic downturn in US history. It began in 1929 and did not abate until the end of the 1930s. The stock market crash of October 1929 signaled the beginning of the Great Depression. By 1933, unemployment was at 25 percent and more than 5,000 banks had gone out of business. This is only part of the story. Farmers struggled with low prices all through the 1920s, but after 1929 things began to be hard for city workers as well. After the stock market crash, many businesses started to close or to lay off workers. Many families did not have money to buy things, and consumer demand for manufactured goods fell off. Fewer families were buying new cars or household appliances. People learned to do without new clothing. Many families could not pay their rent. Some young men left home by jumping on railroad cars in search of any job they could get. Some wondered if the United States was heading for a revolution. During World War I, farmers worked hard to produce record crops and livestock. When prices fell they tried to produce even more to pay their debts, taxes and living expenses. In the early 1930s prices dropped so low that many farmers went bankrupt and lost their farms. In some cases, the price of a bushel of corn fell to just eight or ten cents. Some farm families began burning corn rather than coal in their stoves because corn was cheaper. Sometimes the countryside smelled like popcorn from all the corn burning in the kitchen stoves. Daddy told me that they would collect corn cobs and sticks just to get enough food for the horses in the winter. In some ways farmers were better off than city and town dwellers. Farmers could produce much of their own food while city residents could not. Almost all farm families raised large gardens with vegetables and canned fruit from their orchards. They had milk and cream from their dairy cattle. Chickens supplied meat and eggs. They bought flour and sugar in 50-pound sacks and baked their own bread. In some families the farm wife made clothing out of the cloth from flour and feed sacks. They learned how to get by with very little money. But they still had to pay their taxes and debts to the bank in cash. These were tough times on the farms. There was such a surplus in 1933 that the AAA called for the destruction of some crops and livestock. But the following year, nature more than eliminated the surplus. In the plains states of Texas, Oklahoma, Kansas and Nebraska, the lack of rain had dried up much of the topsoil and blow it half way across the continent. All across the Midwest severe heat and drought parched the land. Many families lost all they had and hearing of the riches in the west packed up what they had and went to California, Oregon, and Washington to find a better way. Those that stayed…struggled desperately. There was such a surplus in 1933 that the AAA called for the destruction of some crops and livestock. But the following year, nature more than eliminated the surplus. In the plains states of Texas, Oklahoma, Kansas and Nebraska, the lack of rain had dried up much of the topsoil and blown it half way across the continent. In Iowa severe heat and drought parched the land. 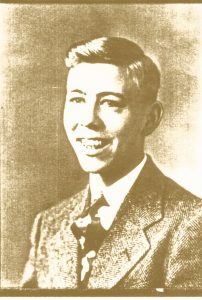 Cecil was raised on a farm near Reynolds, Nebraska and attended country school. I asked him if he walked to school or if Grandpa took him. He told me that he and his younger sister Carol had a white pony that they would ride to school. They would tie it to a tree and somehow the pony always got loose and went home…so they would have to walk home. One day they were on their way home from school and as most horses will do…it was in a hurry to get there. When they got to the drive the pony took a sharp turn into the drive and Cecil and Carol went flying into the culvert. Grandma was so so distraught that she didn’t like the children riding the pony after that. Cecil’s brother Cliff told that as a child, Cecil was a cry baby. I don’t think he ever out grew that. He had a big heart and emotions overtook him at times. When Cecil was just a toddler, Marie was dressing chickens. Back then they would boil large pots of water outdoors over a fire, and dunk the chickens into the pot to make the feathers easier to pluck. Cecil got a little too close to the pot and knocked the boiling water over on him. Cliff remembers him crying for days as Marie tried to console him by rocking him. Whatever treatment they used back then must have been good because he was not scarred from the accident. Jackrabbit drives in midwest were viewed as a battle of survival between farmers and the rabbits during the Great Depression and the Dust Bowl in the mid 1930s. The land was plagued with hoards of Lepus californicus melanotis, black-tailed jackrabbits. These jackrabbits were migratory and ate green plants and their roots. Adults were capable of producing three to eight offspring every 32 days. Reminiscent of the grasshoppers 60 years earlier, the rabbits ate everything in their path. Thus, the few farmers who eeked out crops had to cope with the rabbits demolishing their livelihood. In early years the rabbits had been a blessing to people of the Midwest as they provided a meal or two but now they had become a nuisance and the need to diminish the population was vital. They would have hunts where as the farmers would come together and surround a field and round up the rabbits by walking them to the center of the field and clubbing them. Cecil participated in one such hunt, and he said it was the most horrible brutal thing he had ever witnessed. He never did it again. Cecil had a tender heart, and it wasn’t any easy thing for him to kill an animal. We was never a hunter, but did love to fish. While walking to school Cliff and Cecil decided to stop and check some traps that Cliff had set out. There was a skunk in the trap and they both got sprayed. When they got to school the teacher sent them home as the smell was too bad for anyone to take. 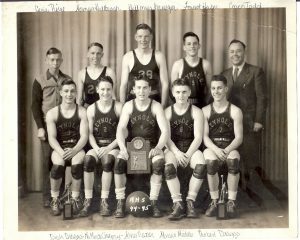 Cecil went to Reynolds High School, in Reynolds, Nebraska and graduated in the 1945-46 school year. He was not able to participate in sports due to the work he was required to do at home on the farm. All he knew growing up was work. They worked hard to keep things going. He never acquired hobbies as some do as his whole life revolved around hard work .His father Venus Vern Pierce died of a stroke in 1948. At that time his brother John came back and took over the farm and Cecil became a laborer on the farm. Even his mother told that it was not right what Johnny did but for some reason nothing was done about it. I asked Cecil what was the naughtiest thing he ever did as a child? He laughed and then recalled that his mother had a big beautiful rooster on the farm, and though it was a beauty, it was mean and would attack him every time he walked across the yard. He was only about seven or eight years old, and he hated that rooster. One day he picked up a sie and when the rooster came at him he clobbered him with it. He thought he had killed it and he knew his mom was going to tan his hide for it. He picked the dead carcass up and laid it in the manger in the barn and waited to be found out! He said the next morning to his surprise the rooster was alive and well. It had come back from the dead but it never messed with him after that. Another time he was playing with matches in the out house and started the outhouse on fire. He got a lickin for that one. He said he had an old pocket watch that didn’t work, and he was playing around the well. He looked down into the well hole and saw all the gears turning in it and he just wondered what would happen if he dropped the watch down in there. So, he let go of it and down it went, getting hung up in the gears of the well, and the pump quit working. He said he never told anyone, and nothing was ever said about it but he was sure he had been the reason for the well needing to be fixed. When WWII struck the United States, Cecil’s brothers Johnny and Cliff were drafted, and Cecil stayed home and took care of the farm with his father. Cecil served in the National Guard for twelve years and was a Lance Corporal. He was part of the 353rd Military Police Co., in Fairbury, NE. The personnel was composed of men from four counties — Jefferson, Thayer, Gage and Nuckolls– with the majority of the members being farmers from Jefferson county. The majority of the members went to Fort Leonard Wood, MO., for two weeks summer training. 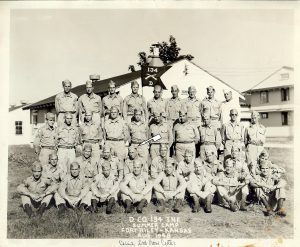 Company C was organize in 1948 when five officers and four enlisted men met in Fairbury with Major Carl Goering and began organizing a reserve unit in the city. On Feb 24, 1949 the first unit was formed, transferring Co. C, 310th Military Police Battalion from Omaha to Fairbury. It was this small group who foresaw an organized company of trained cadre should an emergency ever come. Co. C was organised with Capt. Michael J Schmal named commanding officer. Their first summer field training at Camp McCoy, Wis., was in 1951. On April 19, 1952, when the 319th Battalion was deactivated the Fairbury unit survived the Army reorganization. This was the year the 320th Military Police Co. was transferred to Fairbury. Following the summer field training at Camp McCoy , Col Hardin Sweeny, chief of the Nebraska Military District, and Col. Harry Baker, Nebraska senior Army instructor visited the local unit. It was then decided by the Nebraska Military District to transfer the 320th MP Co to Omaha and the 353rd MP Co. to Fairbury. This was done Oct 10 1952–making the Fairbury unit in a class with pay every Wednesday night and a possible strength of six officer and 212 enlisted men. Cecil is among those listed on the 1953 roster. His rank was Lance Corporal. 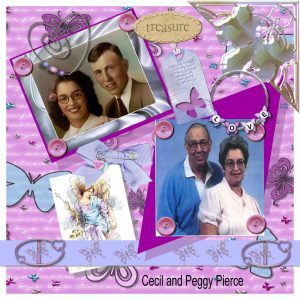 Cecil met Peggy Nutsch from Haddam, Kansas at a dance, and after Peggy graduated from high school, they were married on the 24th of May, 1953 at the Four Square Church in Fairbury, Nebraska. It was a private ceremony with only their parents in attendance. Peggy was a young 16 years old, a naive little farm girl from Haddam, Kansas. They moved in with Cecil’s mother Marie west and north of Reynolds. Shortly after their marriage, Peggy went with her parents to Wichita for a day. They got back late and Peggy stayed the night at her parents and they took her back to Reynolds the next day. Marie asked Cecil where Peggy was and he said he didn’t know. (He knew.) When Peggy came home Cecil’s brother Johnny came and gave her holey hell about leaving, as Marie (Cecil’s mother) had gone to Johnny and told him that she had left him. Johnny often bossed Cecil and not in a nice way. There were times he would come to the house especially early in the mornings and come right into their bedroom and scream at Cecil to get up! Even with all the problems that Cecil dealt with with his brother Johnny, in his late years Cecil made that comment that he had been blessed with the best of brothers. He never spoke ill of any of his siblings, or anyone else for that matter. After this incident Cecil and Peggy made the decision that something had to change, and they moved to his brother Cliffs house south of Reynolds, as Cliff and his wife Barb were in California. The couple went to Blair, Nebraska where Cecil had found work for awhile before they moved to a farm that Cecil bought with money he inherited from his father just north Hubbell, Nebraska, and farmed it for about five years. It was on this farm that Peggy and Cecil begin their family. In 1954 Feb. 22 their first daughter, Charline Lynnette Pierce was born in Hebron, Ne., coincidentally on the birthday of Cecil’s brother Johnny’s birthday. For years we always went to Uncle Johnny’s to celebrate the birthdays together. On the farm Cecil and Peggy had sheep and cattle as well as fields of crops and pasture. 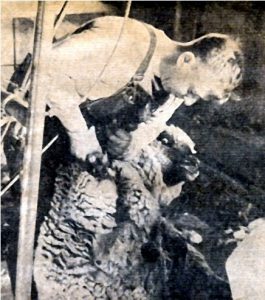 They found it difficult to find someone to shear when the time came so Cecil bought the equipment needed to do it himself and a new career came from it. He was a very good sheep shearer, self taught. He traveled all over the mid-west, and was very well known for his talent. He could easily shear 150 head a day. Through out his life time he made most of his living shearing and claimed that it was from that income that he raised his children. 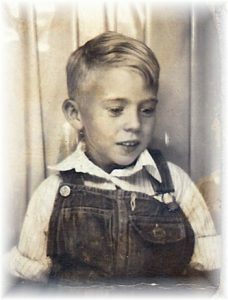 On June 19, 1955 the couple welcomed their first son, Jeffery Daniel Pierce to their family, also born in Hebron, Nebraska. In 1956, the farm crops looked very good, but nature took it’s toll and all of the crop was lost due to hail and grasshoppers. They were expecting their third child when they packed up that fall and traveled to Oregon where Peggy’s brother Jack was working. The Land of Milk and Honey! Cecil obtained work as a welders helper on the ships in Portland, and they lived in an apartment in St. Helens. In December, the 8th day, the sun was shining brightly when Peggy gave birth to their third child around noon. When she left the hospital that evening with their new baby daughter, Susan Annette (myself), it was snowing big white flakes. The hospital bill was 98 dollars and it had to be paid before they left. Joke was that they left Oregon without ever paying the doctor bill for the birth so I was to be on alert for repossession. 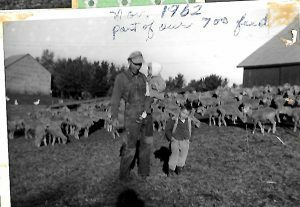 Cecil worked out the winter in Oregon, and they then returned to the farm in the spring of 1957 in time for planting. On the moved back to Nebraska they were caught in a snow storm and had to spend a couple of days in the basement of a church. On December 13, 1958 a second son was born and was named Henry David. Cecil then bought a farm on the county line just south of Narka, Kansas.. They called it the county line farm as it was right on the Republic/Washington Co. lines. Here he and Peggy raised livestock, had an orchard, and acres of crops and pasture land. Many times he would go to Haddam and work part time at the elevator, and still continued to shear sheep while Peggy was left alone with the farm work and children to tend. She loved the country life having grown up a farm girl herself. 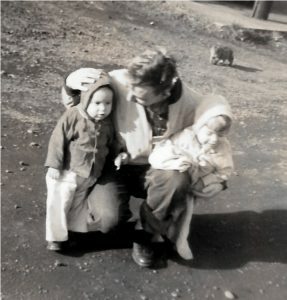 While on the farm in Narka, Cecil and Peggy had two more children, Angelia Gail, born August 24, 1960 and Clifford Martin, born November 28, 1962. 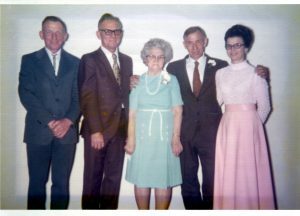 Cecil and Peggy had a farm auction in December of 1964, sold the farm and moved to Byron, Nebraska early in 1965 where Cecil leased a tavern and ran it for a couple of years. Often during this time Peggy would work the tavern during the day and Cecil would shear sheep or work various other jobs. A month after their move to Byron, Andrea Rose was born on February 15, 1965. Cecil bought an empty building on main street in Byron and moved the tavern to that building. He received a liquor license and built a big dance floor and beer garden and had dances about once a month. Still while living in Byron, Cecil and Peggy received their last two children, Matthew Lon born June 15, 1966 and Beth Marie born April 26, 1968. After seven years in Byron, in 1971 Cecil again became restless and they sold the tavern and home and made plans to move to Mankato, Kansas where the couple purchased Dreamliner Motel.Their oldest daughter Charline, married Wayne “Dink” Snyder that year on July 21 in Hebron, Nebraska. He was the son of Kenneth “RED” and Maxine HOLMES Snyder of Superior, Nebraska and was serving as a marine during the Vietnam war and was deployed at the time. They moved the family in the September of that year to the apartment attached to the motel. The children started the school year in Mankato in August. Jeff and Susan were sophomores in high school. They would get the children up at 3 in the morning and Cecil would drive them to the Lovewell lake where they would meet the bus and ride to school from there. It made for very long days as it would be nearly 6 in the evening before they got home. Annie (Andrea) was only in the first grade, and would fall asleep on the bus on the way home and Susan would carry her to the car where Cecil would be waiting for the children. This business venture turned out to be a bad investment and after a long court battle, they bought a large Victorian home in Mankato and Cecil went to work at the Dubuque Packing plant until he opened up the first private club in Jewell County, Kansas and named it the Hideaway. He did very well here and employed his three oldest daughters, his wife and several others and after three years they sold the club, had an auction where they sold most of their belongings and moved to Missouri. By this time only the three younger children remained at home. Jeff had started his own mechanic business in Mankato after he graduated high school in 1974, and Susan married Jack Alcorn son of Doyle and Barbara Alcorn on May 24, 1974 one week after her high school graduation. Henry graduated high school in 1976 and went to Beloit Vo Tech before he married Kimberly Elkins, May 25, 1980. She was the daughter of Bud and Kay Elkins. Angelia graduated high school in 1978 and married Roger Reiter on May 28, son of Arnold and Pauline Reiter. Clifford moved to Gordon, Nebraska where he worked putting up irrigation sprinklers. In 1979 Cecil and what was left of the family at home, moved to Jenkins, Missouri. Cecil didn’t like it in Missouri and was not happy about anything while they were there. Their youngest son Matt didn’t like Missouri either and moved back to Mankato where he lived with his older brother Jeff and sister Angelia until he was out of high school and able to support himself. They struggled financially, as the sale of the Hideaway was to be their retirement money, however a few months after the move the Hideaway burned to the ground and they had to fight to recover the money. During that time Cecil did some shearing and worked a few places, but just was never satisfied. Peggy however, loved it there and she was able to work at her crafts and have her animals and the peace and quiet of the country. They had a nice home on an acreage in the country south of Aurora, Missouri. Cecil put the property on the market and it sold right away to their surprise. This resulted in the decision to move back to Kansas. 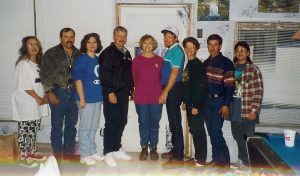 He and Peggy returned to the Narka, Kansas area in 1983 and they opened a restaurant/grocery store that they ran for nearly 20 years. They left Missouri with only their youngest child, Beth remaining. Andrea chose to stay in Missouri and finish her last year of high school and then married Doug Wilson of Aurora. Cecil and Peggy operated the store and for a time the gas station. He served on the city council and even took his turn at being mayor. 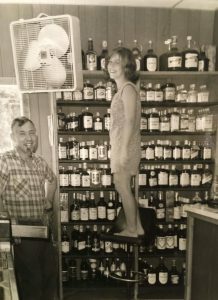 Upon reaching the age of retirement, Cecil closed the store, and worked part time in the nursing home in Belleville, Kansas. 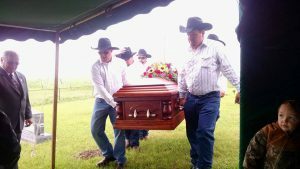 He helped out at the elevator in town during the harvest, and mowed the city grass, and did other odd jobs until he just couldn’t do anything anymore. He raised dogs for awhile then phased that out. Peggy however, continued on with dog raising right up to the day of her death in 2017. Cecil passed from this life on a Monday, May 11, 2015 at the Belleville Health Care Center where he had resided for three years, at the age of 87 years, after suffering for several years from a paralyzed colon, high blood pressure and a series of strokes. He is buried at the Union Cemetery south of Narka, Kansas. Cecil did various other jobs over the years, but was most proud of his sheep shearing skills. 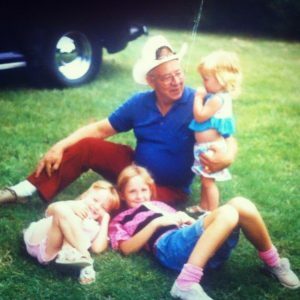 He felt his biggest blessings were his children and grandchildren and was extremely proud of all of them. He could hardly speak of his son’s without tears of pride coming to his eyes. At the time of his death he and Peggy had 28 grandchildren: 42 great grandchildren’ and a number of nieces and nephews. straying not to far from home. he starts spreading it around. and he never stays too long. and then he travels on. the jelly from his bread. to him what just looks wrong. and complains of his age too. or places that he’s been. if he speaks about his kids. that’s one thing that he know’s. every time they call him “Dad”. Hi Susan! This article was beautifully written. It was so delightful reading about your family history. There were a lot of amusing moments like the time your dad and cliff rode a pony to school and when they got sprayed by a skunk. Wow, what are the odds of getting sprayed by a skunk… I wondered if they were messing with it lol. I admired your dad’s hard work, although, he didn’t have much of a childhood, he gained a work ethic to provide for his children… amazing father! Yep he was a pretty special guy. My brothers all said that is one thing they learned from him…how to work. It is really interesting that Cecil served in the National Guard for a really long time. It definitely adds something to this story. Do you think that can we find more info about that? He was a pretty special man.